There is something about watching the AT&T Pebble Beach Pro Am that makes me wish for better weather so I could tee it up. With the weather here being so cold, I stayed inside and watched way more TV this weekend than normal. If you are like me, you want to play more golf this season. Purgatory has several memberships that will help you reach that goal. The price of these individual memberships varies between $1450 and $2500 depending on time/day restrictions. That is less than I spend on week’s golf vacation, somewhere warm, and no we do not go to Pebble Beach (would be nice though). I’ve heard many people say their golf membership is a mental health investment, giving them a time and place to recharge. With membership you get freedom, it removes the barriers that are costing you rounds. These reasons are no longer applicable: limited time, unpredictable weather, lack of a prearranged group, and perceived monetary value. If it rains after 5 holes who cares, I still got to play a few! Now you have time for a bag of range balls and a couple of holes, if a meeting cancels or after work. We have highlighted 10 reasons why Purgatory is fantastic club to join for membership. 1. The Course – Our award winning golf course. 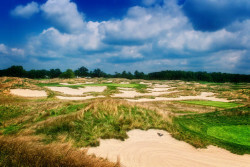 Purgatory Golf Club has been ranked in the top 100 public place to play, including the #1 ranked public facility in the state of Indiana, 50 best courses for women, and we are consistently ranked in Golf Digest Best Places to Play. We have hosted all four major Indiana golf championships: 2007 State Open, 2010 Indiana PGA, 2013 Women’s State Open and 2014 Indiana Amateur Stroke Play Championship. While awards and recognition are nice what really distinguishes Purgatory Golf Club is that the course is playable for all skill levels. The landing areas are very generous and a strategic play will be rewarded. With 6 sets of tees on every hole the course will provide you with the correct challenge for your handicap, we encourage you to determine tees based on weather and wind conditions. With over 216 acres dedicated to golf and no homes on the property you are sure to enjoy the scenery and serenity of Purgatory Golf Club. 2. Conditions – A great layout is a start but what about conditioning? You’ll find that Purgatory has consistently the finest conditions in the area. While most clubs have been cutting costs we remain dedicated to providing pristine playing conditions. 3. Practice Facilities – Once you have exposed your weakness on the course you can start working on improving them with our practice facilities. Our bent grass driving range tee has been professionally leveled to ensure level lies, perfect conditions to promote perfect practice. The range has strategically placed target greens and bunkers so you may replicate drives and approaches. As we know hitting it in the fairway is important for your score. Our 4 acres short game area is built so you can practice almost any shot that you will face out on the course up to 70 yards. The 7000 square foot putting green is undulated very similar to our greens on the course. Many have boasted that we may have the best practice facility in Central Indiana. 4. Instruction / Club fitting – Our staff is affiliated with PGA of America and offer individual lessons along with clinics for Ladies, Men and Juniors. If you are improving your game, we are interested in assisting with the process. 5. Convenience – Access to tee times are regularly available, as we normally host under 20,000 rounds per year. Our members are allowed to book tee times 14 days in advance, while the general public is usually limited to 10 days in advance. A high majority of our member rounds were played in under 4 hours last year. Please take into account when you play greatly affects the pace of play. Our staff is happy to recommend times that are general more open. 6. Impress your Guests – Our lodge and course are sure to impress even your most finicky guest. All of your accompanied guest will receive discounted rates that match our frequent player’s card. Enjoy a drink or a meal in the Confessional bar before or after your round. 7. Golf Cars – Our golf cars have state of the art GPS systems attached to them. With a touch of the screen you instantly know distance and direction requirements needed for success. You may also keep score with the GPS system. 8. Camaraderie – We will introduce you to other members and invite you to partake in special events. Some examples of special events last year were: Men’s nights, Ladies nights, Wine tasting, Club Championships and WLGO tournament. 9. No long term agreements – Our membership is for the calendar year only. Our goal is to retain you for the next several seasons but we understand it is difficult to commit to a long term agreement. 10. Staff – Our passion is golf, and we are dedicated to promoting the game of golf. Our staff enjoys being here and is thrilled to share with our members. All members of our staff are trained in Ace Management training program to ensure all of our customer needs are satisfied. Our unlimited golf membership and weekend only golf membership rates include the use of a golf cart and driving range. Walking is always available, if you prefer. In addition to what is listed if you sign-up and pay before March 31, 2015 we will include a voucher for 2 guest rounds. The voucher is good Monday through Friday, no Holidays and limited to the first 25 people who sign-up. I would be happy to answer any additional questions you may have either by email brhodes@purgatorygc.com or at 317.776.4653.